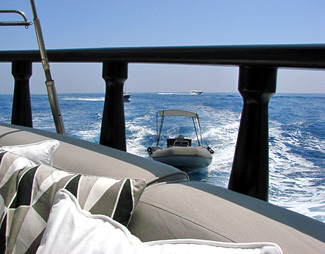 My Week Off: Cap d'Antibes / Cap Ferrat | PX This. I used to do lots of things. Now I do other things. Okay, as a certain somebody pointed out to me yesterday, I guess it’s really more like four or five. 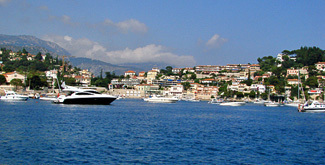 What made you choose Cap d’Antibes and Cap Ferrat for this vacation? As I explained before, I didn’t exactly choose it; I was just lucky. 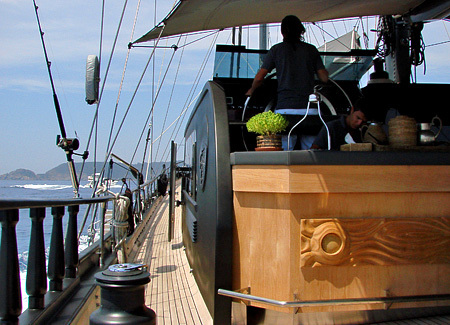 A couple of years ago, I was invited to sail the Turkish Riviera to Greece aboard the Black Sea, a 110′ sailing yacht owned by an incredibly lovely family I was fortunate enough to have been able to do some very miniscule favors for, once or twice. Evidently, I was such “a good guest,” they invited me back this year to cruise the Cote d’Azur with them all the way to the Ligurian Coast. Obviously, I would have been a total idiot to refuse. It was one of the most amazing trips of my lifetime (and despite the danger of sounding crass, I must say I’ve been blessed to have experienced some pretty fantastic journeys all right). Still aboard the Black Sea. It has four separate guest chambers (all with full bathrooms), as well as a Master Chamber and sleeping quarters for a crew of five. Magnificent, impeccable, luxurious. 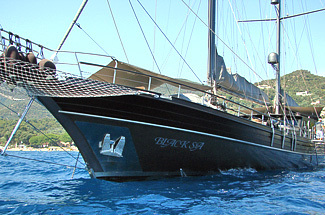 The Black Sea was entirely custom-built according to the stringent specifications of its owner. It looks and feels "like an Ian Schrager hotel," which is precisely the way I’ve heard at least several visitors aboard describing it. From what I’ve witnessed and gathered, the Black Sea is famous along the coasts of Turkey, Greece, and apparently, Croatia. 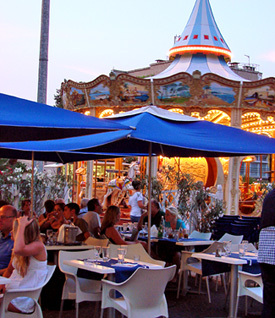 It would be far from a stretch of the imagination to assert that surely it has now made its mark on the French Riviera as well. It turns heads (and camera lenses) absolutely everywhere it goes. Aside from the trip being far too short? No. Oh, there’s the food thing— there’s way too much of it. Breakfast, a meal I never eat, is the most problematic. Where I’d much prefer simply three consecutive cups of coffee, there is instead a daily sumptuous buffet of European delectables. And in the company of generous Turkish hosts, to decline is practically an insult. Thank goodness for the available selection of fresh fruits and juices, or I likely would have gained ten pounds. I’m getting to be so much better a swimmer! No, really. See, evidently, boating/yachting is so ingrained in Turkish (and Greek) cultures that everybody swims like dolphins in the sea practically from the day they’re born, I am not even kidding. The first time I traveled aboard the Black Sea, I was a vastly pitiful swimmer in comparison— it was really embarrassing. I mean, even though my form is fine, I have very little stamina in the water. Therefore, this time the mere idea of swimming smack out there in the middle of the Mediterranean again at plunging depths of god-knows-what was still a downright harrowing experience to me. I am not at all exaggerating when I say my hosts (and their friends) dive right into water at nearly every port and swim for miles on end with nary a care in the world. So, you either have to keep up at some semblance of competence, or forever be labeled the histrionic, unworldly city-dweller who would drown in a puddle of saliva. Well, the truly amazing thing about the Mediterranean is it resembles our Atlantic and Pacific Oceans not a wee bit. It’s fantastically placid and, in some places, as warm as your bath. You’d have to be an histrionic, unworldy city-dweller who would drown in a puddle of saliva to not appreciate and take advantage of its splendor. Believe it or not, two summers ago I swam from the shores of the island of Symi to the Black Sea, at a distance approximately equal to 3/4 the way across the Hudson River to New Jersey (even though I was pretty much kinda scared to death). Later, in retrospect, I realized it was an utterly stupid thing for me to attempt at my skill level and vowed never to do it again. So okay, I didn’t accomplish that same feat during this expedition, but I do dare say I came pretty close! Anyway, my point is: Wow, Cap Ferrat was a really great place to swim— overall of all the places I’ve bobbed in the Mediterranean by now, I’d probably rank it tied for second or third. 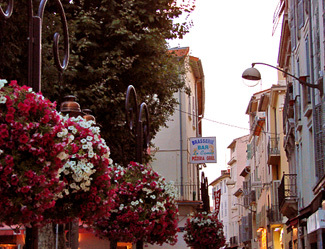 As for Cap d’Antibes— apparently, from what I surmise, it’s a huge hit with travelers who love the South of France, but "detest St Tropez" (that’s a direct quote). Sooo, it’s kinda like people who hate the Meatpacking District but love the West Village. I guess. Wait, we’re still not quite done yet! But to answer the question: believe me, still not anywhere remotely as much as its worth. This sort of clever work and exposure! Keep up the fantastic works guys I’ve added you guys to blogroll.